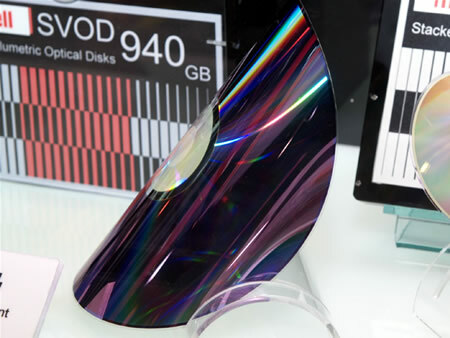 Hitachi took storage to the next level with its SVOD (Stacked Volumetric Optical Discs) technology. It all starts with super slim DVD discs which are just 92 micrometers thick and these double sided discs hold 9.4GB. Pack 100 of these discs in a 6.4cm catridge and you have 940 GB of storage. Now the Japanese tech giant is preaparing to take it to next level by replacing double sided DVD’s with Blu-Rays the result a 5X boost to storage space as a double sided Blu-Ray disc holds 50GB. Though the Blu-Ray model is still in development stage the DVD version will go on sale by early 2007 with a 940GB cartridge costing about ¥40,000 (~US$340).